“Letter H is for Helping Week” Blog Recap! “Letter H is for Helping Week” was Honorable, Humbling, and of course FULL of Helping! For the first time this year, the students held off on bringing shares to school; however, the students did not come to school empty handed! 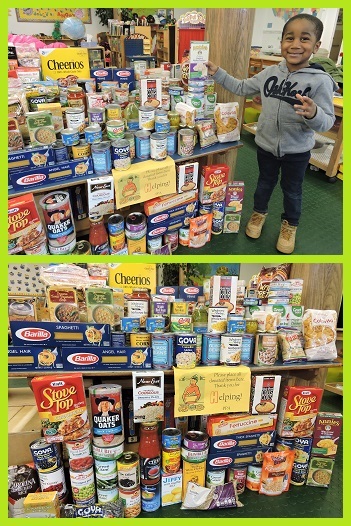 All week long, the students (and their parents) entered PPA with assorted canned goods and dried food. This food was collected throughout the week and on Friday was donated to The Hoboken Shelter, a local organization and food pantry located at 300 Bloomfield Street that helps feed and find housing for families from all over the surrounding area. Take a look at the photo below to see the donations from the extremely generous students (and families) of Park Prep. We are sure that this donation will help fill the bellies of so many people this holiday season. Thank you to all of the families that contributed to this large and impressive donation! In order to begin the Helping schedule on Monday, the students were asked the following question – “What is a Senior Citizen?” The students seemed a bit puzzled. The teachers helped explain that senior citizens (or seniors for short) are people who have been alive for a VERY long time! One student raised his hand and asked, “Alive for a long time – like 6 years?” The teachers explained that seniors were more like SIXTY-SIX years old! Like everyone from time to time, seniors need a little extra care – particularly around the holidays. The seniors that the PPA students decided to help are the permanent residents of the Alaris Health Care Center at Hamilton Park located at 525 Monmouth Street in Jersey City. The students spent their morning crafting beautiful and elaborate holiday cards for each of the residents. Later in the day, the teachers visited Alaris Health Care Center at Hamilton Park to hand out the cards to the senior residents and Dialysis Center patients. The cards surely helped make everyone at the A.H.C.C.H.P. feel so special and happy during the holidays! Due to patient privacy, we are not allowed to photograph the residents/patients but be sure to keep reading to view the video from “Letter H is for Helping Week” a few years back to help your child understand how special they made someone feel this week! The students spent both Tuesday and Friday morning working one on one with the teachers to complete their Letter H identification/fine motor activity sheets. The teachers were so impressed with how easily the new students recognized the letter H and also how well the older students remembered all things “H” during their morning work! In the afternoon on Tuesday and Friday, the students created the eighth letter list of the year! Naturally, the letter H list was full with Heaps of H words! As a whole group, the students took turns brainstorming and contributing words that begin with the letter H and also Hunted around the classroom for letter H items! Afterwards, they participated in a discussion about what it means to HELP. During the discussion, the students decided that helping was when you do something nice for someone else. 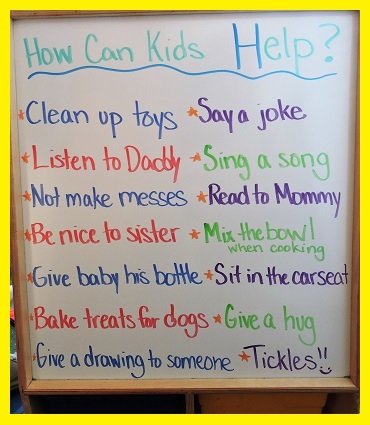 They also brainstormed a list of ways that kids can help out! Take a look below. The teachers informed the students that Wednesday’s morning work activity would be all about helping another very special group of people – the local police officers and firefighters! These brave men and women spend each day helping keep all of the people in our community safe! While it is hard to express our gratitude entirely, the PPA students were eager to help in any way possible! Taking a note from Operation Goodybag, a NJ-based community volunteer organization where school-aged children design and prepare goody bags to express thanks to military personnel and local servicemen and servicewomen, the PPA students set out to create delicious goody bags for the local Police and Fire Departments. Seeing how much they love receiving goody bags, the students could hardly wait to get started! The teachers explained that step one of making the goody bags involved decorating the bags! The students got right to work that morning by coloring in the heart coloring pages that were later cut out and glued onto each bag. Before long, the time had arrived to get started stuffing them! The students and teachers worked feverishly until every last piece of candy was packed and goody bag was stuffed! The students were delighted to have the opportunity to even present some goodybags to two of Jersey City’s Finest! A special PPA Thank You to Police Officer Borrego and Police Officer Rivera for visiting the students! Take a guess as to how many goody bags they made! 50? No! 100? No! 150? No! That brings the PPA total to 3,300 goody bags over the years! Wow! That is A LOT of goody bags! The helping fun continued on Thursday but this time the students would be helping animals! The teachers explained that some animals do not have a home or owners to take care of them. Unlike the animals in the students’ houses, these animals have to find their own food and take care of themselves. Fortunately, there are wonderful people who spend their time helping these special animals by keeping them healthy, finding them a home and providing them with food to eat. The students were so excited to learn that they would be helping these animals by spending the morning preparing homemade cat and dog treats for them to eat! Following the directions in the recipes, the students mixed together special ingredients and then rolled them into delicious treats! After school on Thursday, the teachers took four full treat trays along with an SUV-trunk-sized food/supply donation over to the Liberty Humane Society facility located at 235 Jersey City Boulevard. The Liberty Humane Society houses both cats and dogs, all of whom were in the mood for a tasty treat! The animals seemed so happy as they devoured the treats the students prepared (as well as some store-bought treats). As the teachers recalled from last year, a video of the feedings was out of the question as it sounded like the doggies were in a “Who can bark the loudest?” contest! The cats were much quieter and took their time eating the treats. The cats all seemed to have a general rule about the cookies- play with the treat first, lick the treat, then eat the treat! Regardless of how they went about eating them, one thing was clear – they were yummy! Check below to meet Americano, the friendliest five year old Rottweiler, who clearly enjoyed the treats! Friday afternoon wrapped up with a technology presentation which recapped the entire week of helping! The students were thrilled to see through photographs and video clips such as the one below which was recorded during another “Letter H is for Helping Week”, just how helpful their hard work was and how much it was appreciated! Wow! What a wonderful and busy week of helping! Park Prep Academy staff and students would like to take this opportunity to thank all of the organizations that opened their doors to us this week. Donations on behalf of Park Prep Academy were also made to each of the groups that helped make H week so special. See you next week! To learn more about or to donate to any of the organizations that the PPA students helped this week, please visit any of the following links. Due to space, we kindly request that attendance is limited to PPA students and PPA parent(s). Please modify all auto-payments accordingly to ensure prompt arrival. Theme for Next Week: Letter I is for Imagination!